Millions of people experience occasional or chronic migraines, and though this kind of condition is not lethal, it affects our life, our productivity and our mood to a great extent. Specialists at Oxford University found out that every fifth case of migraines is caused by genetic factors, along with other various causes of this ailment. Fortunately, there are a lot of effective migraine treatments and ways for migraine prevention, staring from medical management and ending with physical activities. Below, you can see some tips on how to prevent and treat migraines. Watch your daily diet. It should be a very well-balanced diet plan with a great share of fresh fruit and veggies, cereal and grains. Choose the foods with small amounts of fat, and do not forget to consume plenty of water. Learn eating in small portions 5-6 times a day, every 3-4 hours. Avoid such foods and products as artificial sweeteners, carbonated drinks and other soft drinks. Try to keep your body weight in the best range for your height. Avoid increased consumption of alcohol and caffeine. 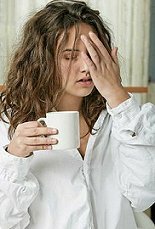 Remember that such foods as coffee, wine and alcoholic drinks, as well as old cheese or chocolate are among the most common causes of migraines. The same can be said about cigarettes. In addition, you can find out what exact foods you consume trigger migraines in your particular situation. How to do that? Keep a record of what you eat and drink, along with your migraine attack occurrence. Control your blood sugar levels. Low blood sugar levels are very common causes of migraines, therefore migraine treatments should also include blood sugar level management. Certainly, it does not mean that those who suffer from migraines should eat lots of sweet foods because this will cause high blood sugar levels which are not less harmful in turn. Develop good eating habits and follow a healthy eating plan. Get enough of sleep on a regular basis. Having good and healthy sleep every night is one of the key elements for successful migraine treatments. At that, it is important to sleep enough but avoid oversleeping, because this factor also plays a role in triggering chronic migraines. Pay attention on the surrounding environment of your bedroom, be sure that you sleep in totally dark and silent room. Take time to exercise and to relax. Regular exercise and physical activities are vital for migraine prevention. Exercise can help in improving blood circulation, improving the immune system and relieving stresses. However, do not try too hard because excessive amounts of exercises and physical activities are considered to be among the most common triggers of migraines. Taking good time for rest and relaxing are very effective migraine treatments, so practice yoga, diaphragmatic breathing, aromatherapy and other relaxing techniques. Use iron supplements. It is believed the anaemia can cause chronic migraines. In order to stimulate your blood cell production in the body, take iron supplements. This is one of the best migraine prevention techniques supported by numerous studies. Try acupuncture. It is considered to be one of the most effective complementary migraine treatments, which can be adjusted to the specific needs of the patient and the dynamics of the ailment development.